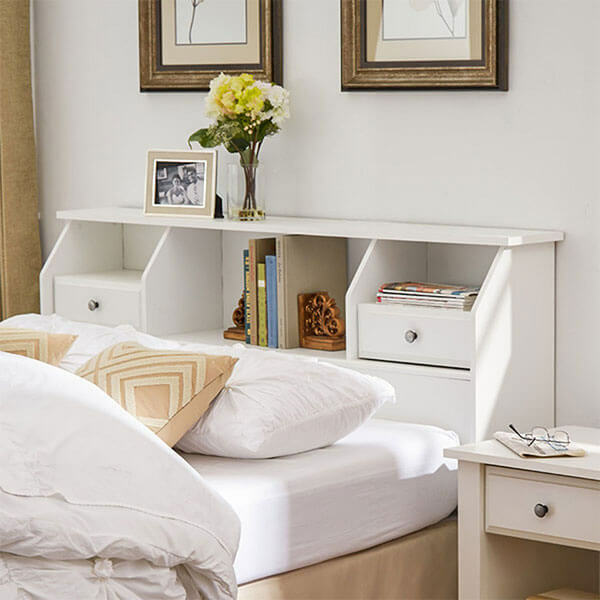 The Prepac Monterey White Storage Headboard offers you plenty of space to store all of your most pressing bedside belongings. It features cubbies of different sizes as well as a shelf for you to store things on. This headboard is finished in a crisp, clean-looking white color. Eliminate the need for huge bedside tables when you store your belongings on the Revere Modern White Storage Headboard. 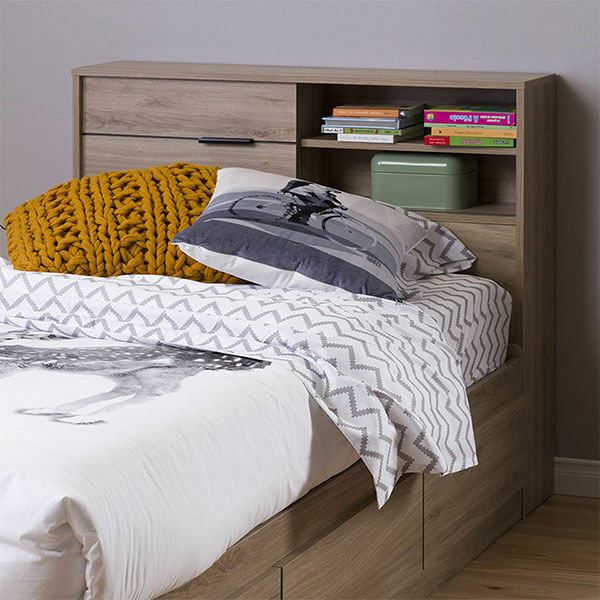 This headboard features not only a long shelf and three cubbies, but it also comes with two storage drawers. It has an enclosed back panel that has access to cords. 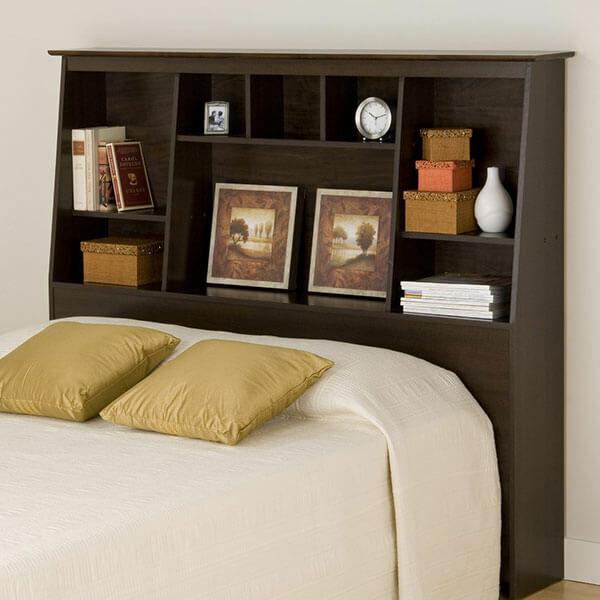 The angular, classic design of the Prepac Espresso Slant-Back Bookcase Headboard adds traditional appeal and plenty of convenient storage in its design. It comes with eight storage compartments and is finished in a rich espresso color. The headboard measures 65.75 inches wide by 55.75 inches high. Store items out in the open or hidden away with the South Shore Fynn Headboard with Storage. This headboard features a sliding door with a sturdy metal handle that hides away two shelves. It also features two open cubbies that allow you to store books, alarm clocks and more. 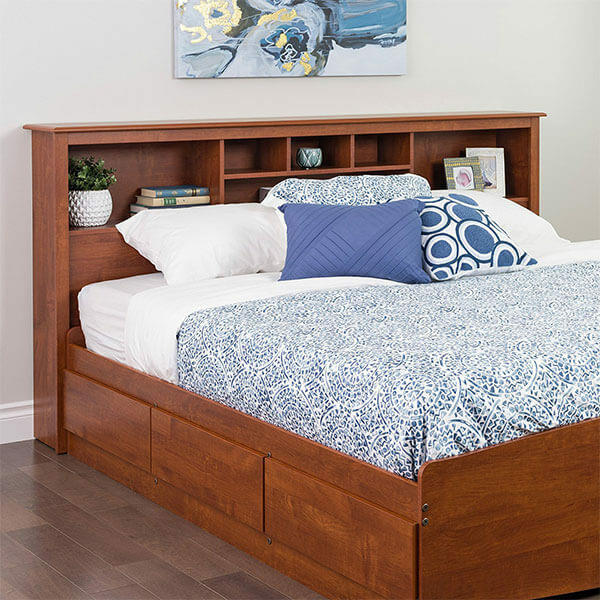 Large and accommodating, the Prepac Monterey Cherry Storage Headboard features two large cubbies on either side of the six smaller cubbies in the center. On top, there is a shelf that spans the entirety of the cubbies to provide you with even more room to store items. Sleek and sophisticated, the Prepac Black Kallisto Bookcase Headboard offers you plenty of space to display or hide away your bedside belongings. In the center of the two cubbies on either side, there is a cabinet that features striking, brushed nickel, oval-shaped knobs and have six-way adjustable hinges on the doors.